The word "Ent" was taken from the Anglo-Saxon (Old English) word ent, meaning "giant". Tolkien borrowed the word from the Anglo-Saxon phrases orþanc enta geweorc ("work of cunning giants") and eald enta geweorc ("old work of giants", which describes Roman ruins). In this sense, Ents are probably the most ubiquitous of all creatures in fantasy and folklore, perhaps second only to dragons, for the word can refer to a variety of large, roughly humanoid creatures, such as giants, trolls, or even the monster Grendel from the poem Beowulf. Ents exhibit wide variation in personal traits (height, heft, colouring, even the number of digits), as they came to resemble somewhat the specific types of trees that they shepherded. Quickbeam, for example, guarded Rowan trees and bore some resemblance to rowans: tall and slender, smooth-skinned, with ruddy lips and grey-green hair. Ents share some of the strengths and weaknesses of trees as well. Their skin is extraordinarily tough, and very much like wood; they can erode stone extremely rapidly, in the manner of tree roots - but they are vulnerable to fire and chopping blows from axes. Ents are also an extremely patient and cautious race, with a sense of time more suited to trees than short-lived mortals. For example, in the Entmoot regarding the attack on Isengard, their three-day deliberation was considered by some to be "hasty". Ents are tall and very strong, capable of tearing apart rock and stone (though they only use their full strength when they are "roused"). Tolkien describes them as tossing great slabs of stone about, and ripping down the walls of Isengard "like bread-crust". Treebeard boasted of their strength to Merry and Pippin; he said that Ents were much more powerful than Trolls, which Morgoth made in the First Age in mockery of Ents. While Ents are extremely long-lived, they are not immortal in the same sense as the Elves: they age with the passage of time, albeit very slowly (At the Entmoot, the hobbits notice that the Ents vary in age from their appearance. Also, when invited to sit down, Treebeard tells Merry and Pippin that he is not very 'bendable', while a much younger Ent, Quickbeam, could 'bend and sway like a slender tree in the wind'). And while they do not die of old age, older Ents often become 'treeish', settling down in one place and growing roots and leaves. Eventually, they may cease to be conscious and become trees entirely. After lengthy deliberation (three days; though from the perspective of the Ents, this is very quick action), they march on Saruman's fortress at Isengard: the Last March of the Ents. They are led by Treebeard, the oldest Ent, and accompanied by the Hobbits Meriadoc Brandybuck and Peregrin Took. The Ents that marched against Isengard numbered about 50, plus Huorns. They destroy Isengard in an all-out assault, ripping down the wall around it, and eventually becoming so enraged the power of their voices alone causes great destruction — "If the Great Sea had risen in wrath and fallen on the hills with storm, it could have worked no greater ruin." — and trap Saruman in the tower of Orthanc. Tolkien later noted that the Ents were partly founded in his disappointment "with the shabby use made in Shakespeare of the coming of 'Great Birnam wood to high Dunsinane hill'" in Macbeth. In the narrative of The Lord of the Rings, six Ents are identified by name. The main Ent character, and the first encountered by the readers and the hobbits, is Fangorn (Treebeard). The other ents are Beechbone, Bregalad, Fimbrethil, Finglas, and Fladrif. Fladrif: Translated from the Elvish as Skinbark. He lived on the mountain slopes west of Isengard. Saruman's orcs ravaged this area, cutting down trees and killing Ents. Skinbark himself was wounded by them. He retreated far up the mountain slopes to live among the birches that he favoured and refused to come down. Bregalad: Also known as Quickbeam, Bregalad was a relatively young Ent at the time of the War of the Ring, roughly "middle aged" and not nearly as old as Treebeard (though he was a full adult; there had been no Ent children since the disappearance of the Entwives). Bregalad guarded rowan trees, and as such he resembled a rowan himself. The word "quickbeam" is an English dialect word for the mountain ash or rowan tree. His Sindarin name (Bregalad) translates roughly as "Quickbeam" (from bragol "sudden" and galad "tree"). He received this name when he said "yes" before another Ent had finished asking a question; this showed that he was unusually "hasty" for his race. At the Entmoot, Bregalad lived up to his reputation for hastiness; he was the first to decide to attack Isengard, since Saruman's Orcs had destroyed many of his rowan groves. Seeing that Bregalad's mind was already made up, Treebeard sent him to watch over and care for Meriadoc Brandybuck and Peregrin Took, while the debate among the other Ents continued for days. He later played an important role in the attack on Isengard, nearly capturing Saruman himself. Treebeard's song, "In The Willow-Meads of Tasarinan", was sung by William Elvin to the music of Donald Swann on their 1968 recording: The Road Goes Ever On, released on Camedon. The lyrics and music were published in a song book by Allen & Unwin. The Tolkien Ensemble, on their CDs with Tolkien songs, have recorded "Treebeard's Song" ("In The Willow-Meads of Tasarinan", sung by Sir Christopher Lee), "The Ent and the Entwife" and several other Ent songs and poems. Five years before Tolkien began writing Lord of the Rings, Walt Disney's Silly Symphonies cartoon Flowers and Trees featured anthropomorphic trees coming to life and dancing. There is also an evil hollow tree that is more troll-like in appearance. Robot Chicken featured Ents in four separate skits. One featured an Ent being cut down with a chainsaw. Another featured a member of The Surreal Life, in a parody of Lord of the Rings, relieving himself on an Ent, which angered it, prompting it to step on him. Another had a forest ranger showing kids a sap faucet, who tried to get sap out of it, unaware that he was really touching an Ent. A fourth featured several Ents running and a girl shouting "Run, Forest! Run!! ", parodying the famous quote from the film Forrest Gump. There are plans to erect a statue of Treebeard by Tim Tolkien, J.R.R. Tolkien's great-nephew, near his former home in Moseley, Birmingham. It is possible that nearby Moseley Bog may have been one of the first places where the young Tolkien regularly encountered trees of various species. In such fantasy and role-playing games as Dungeons & Dragons (D&D, see plant creatures), EverQuest, Square Enix's Final Fantasy series, Magic: The Gathering, Thief 2: The Metal Age, Games Workshop's Warhammer Fantasy Battle, Warlords series and the Warcraft PC game series, Tolkien-like Ents are known as "Dendroids", "Treants", "Treefolk", "Treemen", and "Woodskins" for trademark reasons, much as Hobbits are only referred to as Halflings in such works. Similar creatures are also depicted in the MMORPGs RuneScape, Rift, and Rubies of Eventide, as well as the real-time strategy game Myth: The Fallen Lords, among other games. Wesnoth has units based on the fictional race wose (similar to ents). In some incarnations, these tree-people are very close in spirit to their Tolkienesque forebears, although others, like D&D, have explored the concept of corrupt trees and tree-like monsters (akin to Old Man Willow and the Huorns of Fangorn). 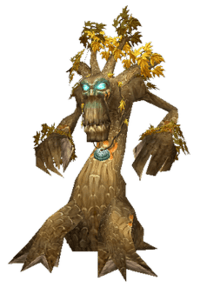 For instance, in the MMORPG Shadowbane, Treants are mid-level monsters. In the Skylanders reboot of the Spyro franchise, there were some Ents like Stump Smash from Skylanders: Spyro's Adventure and Tree Rex from Skylanders: Giants. The Dreamstone features a race of plant-based forest guardians called the Wuts, with similar characteristics to both the Elves and Ents of fantasy. The Wood comes alive to save the Narnians in the final battle of Prince Caspian, written by C. S. Lewis, a fellow member with Tolkien of the Inklings. In the film adaptation of the book, these trees resemble Huorns more than Ents. In the Guardians of the Galaxy comic book and film, Groot is a member of an alien species resembling Tolkien's Ents called the Flora Colossi. Voiced by Vin Diesel, this sentient tree can regenerate body parts and even clone himself if killed. ↑ Shippey, Tom (2001). J.R.R.Tolkien - Author of the Century. Houghton Mifflin. p. 88. ISBN 978-0-618-12764-1. ↑ The Two Towers, book 3, chapter 5: "The White Rider". 1 2 3 4 5 The Two Towers, book 3, chapter 4: "Treebeard". ↑ The Two Towers, book 3, chapter 9: "Flotsam and Jetsam". ↑ Unfinished Tales, Index, entries for Ent, Enyd, and Onodrim. 1 2 The Silmarillion, chapter 2: "Of Aulë and Yavanna"
↑ The Fellowship of the Ring, book 2, chapter 2: "The Council of Elrond". ↑ The Return of the King, book 6, chapter 6: "Many Partings". ↑ The Fellowship of the Ring, book 1, chapter 2: "The Shadow of the Past". ↑ Tolkien, J. R. R. (1981). Carpenter, Humphrey with Christopher Tolkien, ed. The Letters of J. R. R. Tolkien. Boston: George Allen & Unwin/Houghton Mifflin. ISBN 0-04-826005-3. ↑ The Two Towers, book 3, chapter 8: "The Road to Isengard". ↑ Letters, No. 163, footnote, pp. 211–12. ↑ "The Fall of Troy at AllMusic". ↑ "Moseley Statue". 2007-09-05. Archived from the original on 2005-11-03. Retrieved 2014-03-25. ↑ Heroes of Might and Magic Mods and fixes. ↑ Heroes of Might and Magic Sylvan creatures. ↑ Heroes of Might and Magic Rampart creatures. ↑ "Marvel's 'Guardians' rockets to top of box office". Mail Online. 3 August 2014. ↑ "OFFICIAL: Vin Diesel to Voice Groot in Marvel's Guardians of the Galaxy - News - Marvel.com". ↑ Russ Burlingame. "Guardians of the Galaxy: Dancing Groot Clip Officially Released in Hi-Rez...And James Gunn Was the Dancer". Comicbook.com.